Spread over an area of 4000 square meters, this archaeological museum displays cultural relics found in the excavation of the Three-star Piles site. This site is one of the prime archaeological sites in China and stretched over 12 square kilometres. This relic was discovered by chance. In spring of 1929, a peasant found a piece of bright-coloured jade while digging his farm. This acted as a catalyst in discover and later around 400 jade items were found in the excavation. The excavation shows a development from late Neolithic Age (7000 BC-5000 BC) through to the late Shang (16th - 11th century BC) and early Zhou Period (11th century BC - 711 BC). The relic site dating back to 3000 years might have been the capital of ancient Shu. The museum is divided into four sections and displays around 1000 relics and the two sacrificial pits of Shang Period, including gold plate, bronze ware, jade articles, pottery and ivory. The four sections have their own theme of display. Section 1: Splendour of Ancient Shu Culture, Section 2: Mystery of the Primitive Faith, Section 3: Exquisite Cultural Artefacts and Section 4: Three-Star Piles Excavation and Study. The new exhibition hall of 7000 square metres area was added recently to display of jade articles, gold plate and pottery, with the old Exhibition Hall specializing in bronze wares. A must-visit for History buffs! English guide is available at CNY 120. Ticket counter closes at 05.00 pm. 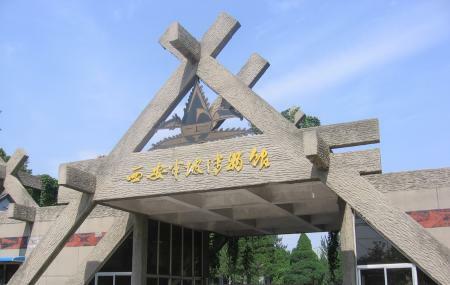 How popular is Sanxingdui Museum? People normally club together Wuhou Memorial Temple and Jinli Pedestrian Street while planning their visit to Sanxingdui Museum.